Iam looking to get my G25 pedals working in FSX. I want to use them as my rudder, it has 3 axis. It works at the moment but the rudder is on one axis, I would like to see them on 2 axis, left rudder and right rudder separate. Now i have to press the rudder all the time to keep it centered. No. There is only one rudder axis. There is no possibility of separating left and right rudder -- and no point. It makes no sense. Sorry. Your two other axes will be toe brakes, not rudder controls. There are separate left and right brakes. That makes sense because differential braking helps turning corners more sharply. It needs proper calibration then. It should be centred with your feet off. I have the above pedals, (calibrated in FSX) as you can see, in its neutral position it will steer to one side, left (or right when its reversed) . To keep it centered, i have to apply force to get the rudder in its center position. by releasing it the axis will go back into its neutral position (by a spring) and the rudder will steer the plane left. Thats why I was hoping that your application would be able to let me use one of the other axis as a rudder too..
No, sorry i cannot see that from your picture! Surely they should be centred when released? Why would they not be except for poor calibration? You need to calibrate correctly so that the "neutral position" IS the position giving you centred rudder! If they are all separate axes then should all be calibrated to give zero when released. If the axes are all separately recognised in Windows, you can most certainly assign both, or all three, to the rudder in FSUIPC. The problem would be that you only have one rudder calibration, not separate ones, because there's only one rudder input to FS. If your pedals both operate in the same direction, this won't work because pressing one side should decrease a value below zero and pressing the other side should increase a value above zero. Furthermore if both axes are providing input values at the same time, the last one to change would "win" (though FSUIPC does have arbitration for the maximum deflection to win instead) -- either way, its use would be somewhat unpredictable. Maybe if the are both operating in the same direction you could reverse one of them by swapping wires around internally? Hey guys, im not sure why Dave is so confused on this issue, but it makes perfect sence to me, and i know how to fix it. First off-FS reads the single peddle as the full axes, when the peddle is full up-since it is spring loaded, like a CAR!, it will be full right, when the peddle is exactly have pressed, it is straight, and full down, it is left. Not exactly hard to understand. As for the whole-why do u want 2 seperate peddles, simply becuause it has to be this way. Yes there is a way to do it, i am doing it right now. First off, you gota grab a 2 programs, PPJoy, which creates the "fake" joystick that you will create the axes into that talks to flight sim, and GlovePIE, i suggest version .29 . create a standered joystick using PPJ. In glove PIE, copy the code into the screen, and hit run. From there, load FS, select the fake joystick, and assign the rudder axes under joystick commands in flightsim control assignments screen. (They may be backwords, if so, hit the reverse switch). Thats it! using Clutch and gas, instead of the friggin break so its stiff! Enjoy buddie! i know i am! 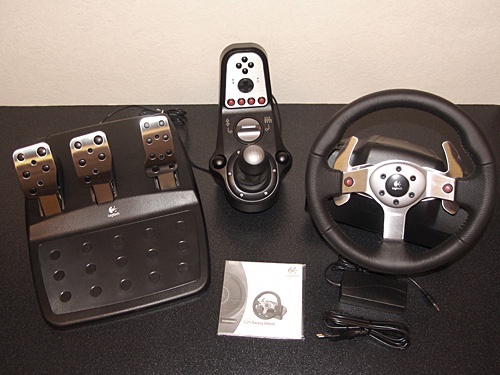 //Combined throttle (Y) and clutch (dial) make virtual joystick axis. This has been driving me crazy. I have the G25 wheel/pedal setup and I'm using the controller from Leo Bodnar to put make the pedals independent from the wheel. The problem with using the G25 pedals is that the rudder axis is on one pedal. That means you have to constantly hold the pedal centered to keep center rudder, lift up to apply left rudder, and push down to apply right rudder. That make it pretty difficult to control. I tried the PPJoy and GlovePIE idea, but it doesn't work. I'm not sure why, but using "joystickX" doesn't apply settings to any joystick. I'm running Windows 7 so it must have something to do with the way that joysticks are read. If you use the GlovePIE tutorial, I can make the Virtual Joystick work with a mouse, but not a joystick. I REALLY don't want to buy rudder pedals, so if anybody has an idea, I'd appreciate it. Surely the pedals and wheel would be separate axes in any case? Generally the wheel is the X axis, or aileron and the pedals are either two separate axes or one (Y) according to Logitech driver settings. Why would you need a special controller? And what do you use for elevator? Strange. What about the other pedal? On my Logitech Formula Force EX the wheel is X but the pedals can be set either to be one axis (Y) or two separate axes (Z and something else I don't recall). I think most driving pedal sets allow either one axis for both pedals (because some driving games do require that), but also allow them to be separated for more sophisticated simulations like GP4, so you can hold brake and high revs simultaneously. Certainly the current Logitech drivers for my pedals provide both options, and can automatically select the mode according to the program being run. I tried the PPJoy and GlovePIE idea, but it doesn't work. Sorry, I've no idea what that's about. How can you possibly make one single pedal into a useful rudder control if it is not made self-centering? You need to be able to have it neutral with no pressure applied, so you need it sprung down half-way. I guess I can understand your confusion here. I have a separate joystick for elevator and aileron control. I want to use the pedals for rudder control only. The crux of the problem that the pedals are three axes and you can only assign one to rudder control. I don't use the Logitech Wingman profiler, so I can't put the accelerator and the brake on the same axis. That means that the accelerator alone controls the rudder. And, like you said, it isn't usable. What PPjoy and GlovePIE does is attempt to create a virtual joystick so you can assign 50% of the rudder axis to the accelerator and 50% to either the brake or the clutch. For some reason, at least in Windows 7, I can't get GlovePIE to find any joystick. My hope was that I'd be able to do that with FSUIPC for that, but I think you mentioned above that it isn't possible. So, I'm hoping that somebody might now a way around this. Okay. so why the business about separation from the wheel? It will be a different axis in any case, so ignore the wheel axis? It seems a bit over the top to have to insert another controller board? The crux of the problem that the pedals are three axes and you can only assign one to rudder control. Three? Ah, is this a set with clutch as well? Maybe they don't default to having two of the pedals on one axis, then? I don't use the Logitech Wingman profiler, so I can't put the accelerator and the brake on the same axis. That means that the accelerator alone controls the rudder. And, like you said, it isn't usable. Is there any reason why the Profiler won't do the job satisfactorily for you? My hope was that I'd be able to do that with FSUIPC for that, but I think you mentioned above that it isn't possible. ... in FSUIPC you can certainly assign both axes to the same Rudder control. That isn't a problem. The problem is that they will both share the same range of values -- presumably, in Raw terms, 0 to 255 or similar? And you can only calibrate them as one, so you can't get one operating the negative range and the other the positive. So, if you had a facility in the FSUIPC axis assignment, to NEGATE the values there, to give 0 to -255 (as opposed to the more usual "reverse", which would give 255 to 0), wouldn't that work for you? You would calibrate the positive side using one pedal and the negative side using the negated pedal -- both in the Rudder calibration section. I could do that quite easily if you think you could use it. I don't know where I'd fit the new checkbox needed, but i'll take a look. Meanwhile, can you see what RAW and Calibrated values you get in FSUIPC's axis assignments for the two pedals you want to use, please? Let me know so I've a good idea what I'm dealing with. Also, since you'd have to test this yourself for me, let me know if it is FSUIPC3 or FSUIPC4 which you need first. The idea of having the pedals as a separate controller is a byproduct of a different sim. I also am heavily into online racing and the Bodnar Box increases the resolution for the pedals quite a bit, which gives finer control for the accelerator and brake. I don't use the profiler because there have been issues in the racing sim I'm currently absorbed in. It's a known issue, but Logitech hasn't fixed it yet. I appreciate you looking into this. I'll get you the RAW values so you can get an idea of what we're looking at here. Where would you like the values to come from? I assume FSUIPC, but I want to make sure. This would be for FSUIPC4 and I need to go ahead and register first. I was waiting to see if I would be able to do something with the pedals, but I think I see the value in registering software with our without. I'll get you the RAW values so you can get an idea of what we're looking at here. Where would you like the values to come from? I assume FSUIPC, but I want to make sure. Hmm. My thoughts about Negating one of the values isn't going to work. Your results show that the Accelerator and the others are working in opposite directions to each other in any case, no the direction of change is already correct. the problem is that the ranges overlap so much. I'm not sure how best to tackle this. It needs more thought. I'll get back to you. where is a signed integer. If you aren't going to be able to use this because it is too complex, I won't bother adding it, so let me know please. Note that you could adapt the RAW values too, but obviously the numbers will be different. I believe I understand. I've just started looking over FSUIPC and it's pretty complex, but I think I understand what's happening. I looked at the .ini file and didn't se an [Axes} section, so I assume that may be because I haven't assigned any axes from FSUIPC. After that, I would just add the info you provided below to the two axes I assign to the rudder. While I don't completely understand why, I assume the numerical info you provide is taking half the resolution for each axis and telling FSUIPC the zero point for each. Well it shouldn't look complex as much as feature-rich. It's like a Swiss Army Knife, a collection of many tools to solve different problems. I looked at the .ini file and didn't se an [Axes} section, so I assume that may be because I haven't assigned any axes from FSUIPC. Yes, of course it cannot create any axis parameters if there are no axes assigned. And Windows INI files don't get created empty. No. it is not, or at least certainly not put like that. FSUIPC is not aware of what a zero point means at all at this level. We are simply dealing with axis values. Meaning comes with calibration, not axis assignment. The same facility could be used to put three axes on the same control, each controlling one portion. No "centre" is understood, yet. FSUIPC would be doing exactly what I said it is doing. The multiplication factor is multiplying the number coming in from your axis and the addition factor is then being added. This is why they are called multiply (*) and add (+), because that is all they do, pure and simple. What is not to understand about that? I would say go ahead and run with it. I'm pretty sure I can figure it out. If not, I can generally ask a lot of questions. Look, it is simple arithmetic. Take one of your axes, the one ranging -16384 (let out) to 16383 (pressed fully). That's the normal full range of a whole rudder or other control axis, but you want it to be only one half of the rudder so you can use the other axis too. So, we want it to run from 0 to 16383 instead. That is, to be zero (0) when not pressed, so it is centred, but still 16383 fully pressed. Since the RANGE you have is 32767 (16384 + 16383 = 32767, right? With me still?) and we only want half this range, so we can accommodate the other axis, we divide by 2. That's the same as multiplying by a half -- primary school arithmetic, right? Still here? In normal decimal notation a half is 0.5 (5 tenths, right?). So the parameter *0.5 says "multiply by 0.5" which, as you should now realise, if you are following me, the same as "divide by 2". Okay? Therefore the second parameter needed is +8192. Now see if you can work out why the other axis needs to be as I said. Let me know when you get there. If you can't, I'll give up. The two pedals will obviously both still be giving values, albeit non-overlapping ones with the above-described facilities programmed as I said. The two axes will both want to move the rudder, one one way and the other the other way. FSUIPC only acts on the last change it sees, and then, with two axes acting on the same control, it arbitrates to the largest deflection. With normal rudders you effectively push one pedal away and the opposite pedal pushes back out to you. With separate pedals, as in your case, you wouldn't be able to emulate this by relaxing one foot whilst pressing with the other. You'd have to only push one pedal at a time -- your other foot removed from the other pedal. If you didn't do this, if both axes were supplying values at the same time, FSUIPC would use the last one changing to the biggest value, and that could change quite suddenly as you relaxed or pushed -- making the rudder swing violently left to right or vice versa. In fact, with your arrangement it would be best to use only one foot, to avoid this possibility, much as you would normally when driving an automatic-geared car. I suspect the same sort of compromise would have to be applied even if you were using the Logitech Profiler. I can't really see an alternative method. Okay. I've added it anyway. I'd like to know what you don't understand so that when I update the documentation (it'll go into the Advanced User's guide) I can word it appropriately. Did you understand my last explanation? Was it pitched too low or is there still something missing? These only contain the DLLs. Just put the relevant one into the FSX Modules folder. The multiplication and addition parameters are both individually optional, but if both given the multiplation one should be first. Multiplication is * where the number can be positive, negative and have fractional parts. Addition is +, or - for subtraction. No fractional parts. The result is always restrained to the range -16384 to +16383, so any result outside that will be left at the relevant limit. You won't see the results of this change in the Axis assignment Tab as the conversion is only done before passing it on to the FSUIPC calibration section (where you will see it), or to FS if you choose to send FS controls instead. I've extracted the DLL in the FSX Mods folder and made the changes necessary to begin testing. I have been unsuccessful at making this work the way I would expect. It doesn't consistently work the same way either, so I'm not sure if that's a byproduct of what you mentioned before or if I'm not holding my tongue right. In any case, I assign both axes to the Rudder on that tab and then modify the [Axes} section of the ini. If I go to the Joystick Calibration tab, I can see that both register the way I would expect...I push one pedal it registers +16383 and when I push the other it registers -16384. But in sim, the behavior is erratic. This behavior is the case whether I pass it to the FSUIPC Calibration section or send it to FS. I'm going to try again to day with a clear head to see if I missed something. You need to send it direct to FSUIPC calibration, for both. Then you need to actually calibrate the rudder, in FSUIPC. You seem to have missed that vital step! You must have something screwedI've tested the new options here using two paddles on one game pad (a Saitek wireless one as it happens), and I can easily get it so the left paddle does the left rudder and the right paddle the right rudder. It works fine provided only one paddle is used at a time. When you apply both then you get random switching depends which is depressed furthest. This is the arbitration taking effect. Please show me both the relevant [Axes...] and [JoystickCalibration ...] sections from your INI file. You guys are making a meal of this :) First off you need to set the throttle and brake axis as combined in order for FS to read the 2 pedals as one axis ie. the rudder. Secondly, you don't need the Logitech profiler software installed to do this as it can be done from the "Game Controllers" section inside windows "control panel" It's only a matter of ticking or unticking a radio button. First off you need to set the throttle and brake axis as combined in order for FS to read the 2 pedals as one axis ie. the rudder. Secondly, you don't need the Logitech profiler software installed to do this as it can be done from the "Game Controllers" section inside windows "control panel" It's only a matter of ticking or unticking a radio button. I'm not sure how to do that either, other than possibly make the config file read-only (stopping you making any changes), or editing the devices CFG files in FS which define the defaults it assumes when it sees a "new" device (i.e. one which wasn't connected last time it ran). Alternatively, if you have a registered version of FSUIPC you can of course disable controls in FS and assign everything through FSUIPC. In the recent versions there are facilities for disassociating the Windows joystick ID number (0 -15) from the Joystick Name, using letters A-Z instead, so that FSUIPC can re-assign by name if things move. to each joystick section in the fs9.cfg that you want to lock. FS has a habit of reassigning some things automatically. This will keep that from happening." Credit to PhilC for that. I'm sure your way will work just as well Pete. I do understand why users would prefer the clutch and throttle to work as rudder rather than brake and throttle because the brake pedal is designed to offer much more resistance (it's physically harder to push down) than the throttle and the clutch is about the right distance apart and feels the same to push as the throttle pedal. Unfortunately, as you know, it's on a completely different axis and I don't see how it would be possible to combine that with the throttle. I suspect it's had wired that way.